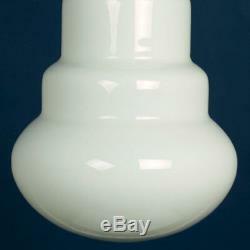 Bulb-Shaped Opal Glass Lamp Luciano Vistosi attr. 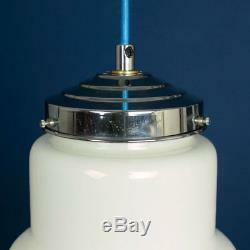 A scarce and large vintage opal white glass lamp shade with chrome plated gallery in the shape of a light bulb, strongly attributed to Luciano Vistosi for the Vistosi Glassworks, Murano. It was probably designed in the mid-late 1970s. The shade is made from a mouth-blown opaque white glass and approximates the shape of a light bulb, and the chromed gallery has a stepped design that recalls a light bulb's threaded base. The lamp accepts an E27 Edison Screw bulb, and has been rewired with a length of new Italian-made vintage-style braided flex in a bold contrasting blue. Nicholas Wilson and Ashley Coleman, the constituent parts of Wilson & Coleman, are dedicated - addicted - to finding wonderful vintage and contemporary interior design objects and works of decorative art from around the world. This means that although we present mostly 20th and 21st Century European objects of vertu we never know exactly what we'll next discover on our travels. We do know, however, that it will never be boring. Selecting items individually also means that there will always be a consistent level of taste, quality and coherence that runs throughout our collections. We would never present anything that we would not absolutely love to own ourselves. 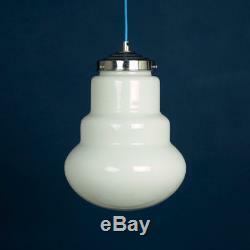 The item "Vistosi Large Bulb-Shaped Opal Glass Pendant Lamp Murano Vintage 1970s" is in sale since Sunday, October 28, 2018. This item is in the category "Antiques\Antique Furniture\Lamps\20th Century". The seller is "wilson_and_coleman" and is located in Lincolnshire. This item can be shipped to North, South, or Latin America, all countries in Europe, all countries in continental Asia, Australia.